5 Commercial Real Estate & Properties in Taylors Beach are listed in 3 categories. We have 3 Industrial Warehouses Sale & Lease , 1 ShowroomsSale & Lease and 1 OfficesSale & Lease . Fantastic Office Space $30,000/Year Plus GST Plu.. Located in the Shearwater Business Park we have available 167m2 of prime office space with Optic Fibre connected to the building, Air conditioning system in place and 5 allocated parking space plus visitor spaces on site. If you're in a service business, telemarketing, programming or design these premises are ideal! Owner will re carpet premises prior to lease commencement. Located in the popular Shearwater Estate this shed offers more space than you could hope for and is located in a quality complex of just 6 units. With 188m2 on the ground floor plus an additional 94m2 mezzanine this is one of the larger sheds available in the area at the moment. Perfect For Any Business $15,000 Plus GST Plus Out.. Looking for a modern industrial unit to give your business the professional look it deserves? Here it is! 150m2 on the ground floor plus large mezzanine area gives this unit tonnes of space. There is an office with suspended ceiling and split system air conditioning, powered roller door, alarm and disabled facilities. Plenty of parking out the front for staff and customers makes this the best unit we've seen for some time. Located in the prestigious Shearwater Estate this 207 square metre industrial unit represents exceptional buying. 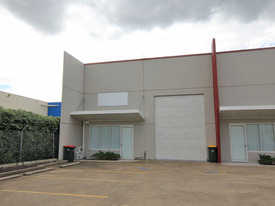 Located close to Bunnings, Supercheap Auto and BCF this unit has endless possibilities for a new or existing business to take advantage of. Call now to arrange an inspection.